U.S. 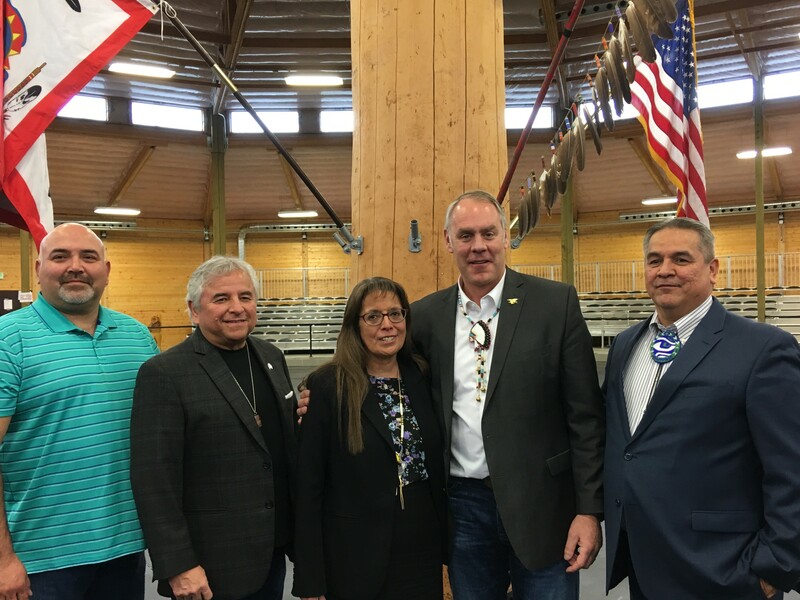 Interior Secretary Ryan Zinke, second from right, poses with Spokane Tribe Chairwoman Carol Evans and members of the tribe's business council Thursday morning, March 22 after meeting to discuss Grand Coulee Dam reparations and ways to address the nationwide opioid crisis. U.S. Secretary of the Interior Ryan Zinke met with leaders from the Spokane Tribe in Wellpinit Thursday in part to discuss legislation that would pay reparations to the tribe for land that was inundated with water after construction of the Grand Coulee Dam. In a sit-down with Spokane Tribal Chairwoman Carol Evans and members of the Spokane Tribal Business Council, Zinke also spoke about approaches to deal with the nationwide opioid epidemic in ways that are culturally appropriate in Indian Country. Members of the council also took the chance to share their thoughts on other issues important to the tribe. As Interior Secretary, Zinke oversees the Bureau of Indian Affairs, and the hundreds of federally-recognized tribes around the country. For years, the Spokane Tribe has asked for reparations due to land lost after Grand Coulee's construction, but legislation has stalled in Congress. In addition to devastating historic salmon runs, the tribe points out that the dam took away more than 3,000 acres of land belonging to the tribe; flooded tribal communities, schools, roads, orchards, farms, and burial sites; and forced the tribe to change the way it accesses the river and participates in commerce. Aside from a payment in 1940 of $4,700, the tribe has not been compensated. "The Spokane Tribe has, in our opinion, not been properly compensated," Evans says. "So every year we continue to go back and ask for congressional leaders to support that legislation." A current version of the bill introduced by Sen. Maria Cantwell, D-Washington, largely mirrors a settlement the federal government came to with the Confederated Tribes of the Colville Reservation in 1994, which resulted in a lump sum payment and annual payments of between $14 million and $22 million, depending on the value of the power sold by the Bonneville Power Administration. Under the bill, the Spokane Tribe would get a one-time payment of $53 million, as well as annual payments. The payments would be about a quarter of what is paid to the Colville Tribes, and not have a perceptible rate impact to Bonneville's utility customers, according to a Feb. 13 letter sent to Cantwell by Elliot Mainzer, CEO of Bonneville Power. "This is one area where Maria Cantwell and I can work together," says Zinke, who served as Montana's lone Representative in the House from 2015 to 2017 before being confirmed as Interior Secretary last March. Asked how he would support the legislation's passage, Zinke says making the face-to-face visit was a good start, so he could put a nation and story to the pieces of paper in D.C.
"Certainly as a former congressman of Montana, I was aware of [the legislation], but now I'm Secretary of the Interior," Zinke says. "We are the champion of Indian Nations. There is no other department within the United States, historically, that has the mission we do of being a champion for Indian Nations." Zinke acknowledges that Interior has not always had a good relationship with tribes. "Interior’s been around since 1849. There are dates within our history that the relationship between Indian Nations and Interior has not been good," Zinke says. "We look forward now to being partners, talking on a nation-to-nation view, and looking at how we could support the sovereignty of a nation. Because sovereignty should mean something. It’s more than a word. It should mean something. And in this case, there was a wrong that we need to look at what path to make it right." Asked if he supports Cantwell's legislation specifically, Zinke says he supports finding a solution to the wrong that was done. "Clearly the tribe, in my judgment, was wronged," he says. "The legislation itself has passed the House at one time, it's passed the Senate, but never in the same year. So my job is to meet with the leadership in the Senate and the House and emphasize that Department of the Interior stands by our duty of being a champion of the nations, and Spokane feels very strongly about this and they have for generations." 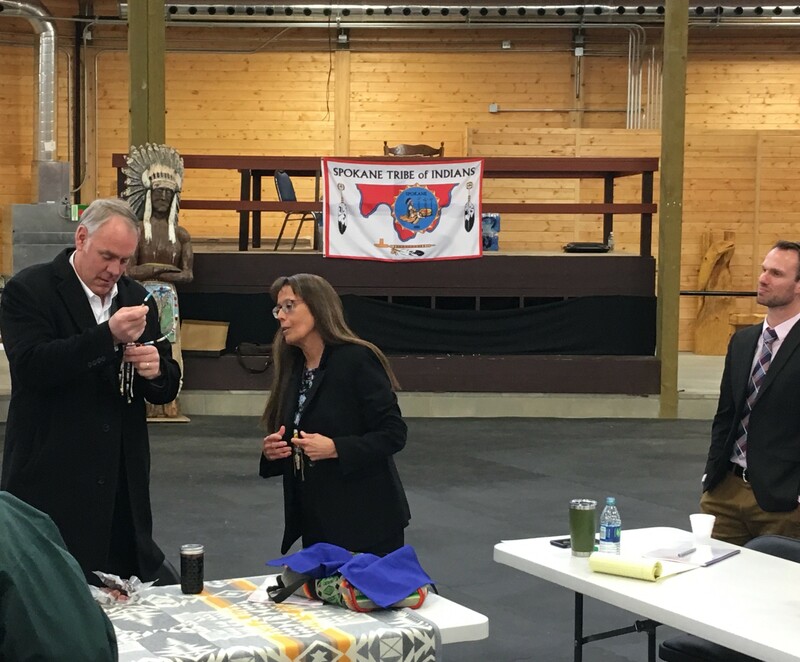 Spokane Tribal Chairwoman Carol Evans presents U.S. Secretary of the Interior Ryan Zinke with gifts of jerky and her homemade huckleberry jam, as well as a dog-tag with a stamped reminder to uphold his duty to the tribe under an executive order from 1881, which established the tribe's reservation. 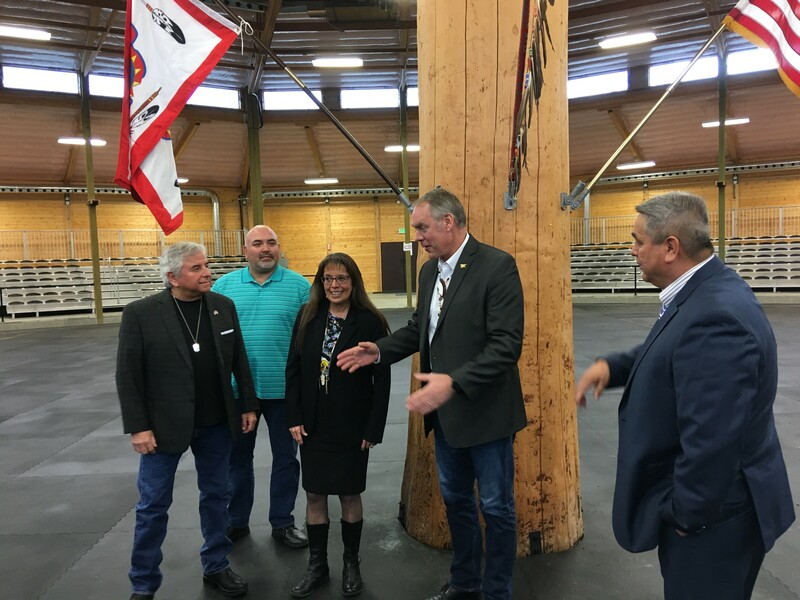 Zinke's trip also included a meeting with the Colville Tribes Thursday afternoon and he was expected to continue to Bellingham on Friday for a visit with Lummi Nation. On the trip, the Secretary is making a point to speak with tribes about President Trump's plan to address the opioid epidemic. "Tribes have been affected disproportionately," Zinke says. "[We discussed] what we can do as Interior, looking at group law enforcement ... we have a number of U.S. law enforcement agencies within Interior that we can coordinate with the tribes." The department is also looking for opportunities to support community-based treatment, he says. "We strongly believe the best treatment is at the community and the tribal level," Zinke says. And Interior can also draw from what is working among the more than 500 tribes it works with to help target programs to kids, mothers and grandmothers, particularly because many tribes are matriarchal and when those members of the community become addicted, it can have the most detrimental impact, Zinke says. "A lot of the opioid and drug information has to be culturally relevant and it has to relate to the targeted population, which is kids, moms and grandmas," he says. Spokane Tribal Council member Glenn Ford says the tribe is in the process of reaching out to membership to get people involved and get a sense of the impacts locally. "We’re taking it at a slower pace that gives us the ability to draw more information and get a better understanding of what we need to do to address it," he says. U.S. Secretary of the Interior Ryan Zinke speaks with leaders of the Spokane Tribal Business Council Thursday, March 22.